McCormick Freeze-Dried Chives are rich green in color with the flavor and aroma typical of fresh chives. Chives have a delicate, onion-like flavor and a bright eye-attracting color so are often used to add color to dishes by sprinkling over the top of finished recipes. 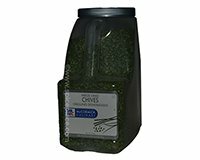 McCormick Chives are sourced from the tubular green leaves of the Allium schoenoprasum plant. Chives are members of the lily family which includes onions, leeks, and garlic. McCormick Freeze-Dried Chives are used in dips, cottage cheese, salad dressings, soft cheeses, dried soups, noodles, rice and potatoes. In recipes, chives are used for both eye-appeal and flavor. Since heat will cause the flavor to expire quickly, chives should be added near the end of the cooking of a dish.